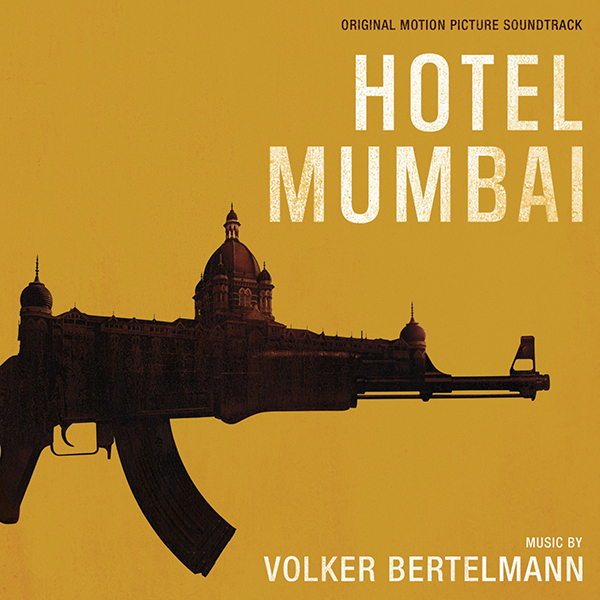 Music.Film Recordings announces the upcoming release of its soundtrack to the feature film Hotel Mumbai with original music from Volker Bertelmann who also records to much acclaim as Hauschka. A gripping true story of humanity and heroism, Hotel Mumbai vividly recounts the 2008 siege of the famed Taj Hotel by a group of terrorists in Mumbai, India. Among the dedicated hotel staff is the renowned chef Hemant Oberoi (Anupam Kher, New Amsterdam) and a waiter (Academy Award-Nominee Dev Patel, Slumdog Millionaire) who choose to risk their lives to protect their guests. As theworld watches on, a desperate couple (Armie Hammer, Call Me By Your Name, and Nazanin Boniadi, Homeland) is forced to make unthinkable sacrifices to protect their newborn child. Hotel Mumbai hits theaters on March 22 in Los Angeles and New York with a nationwide release on March 29 through its US distributors, Bleecker Street and ShivHans. The complete soundtrack will be released digitally on March 22 with a CD release following on March 29. Hotel Mumbai’s director, Anthony Maras, recounts his experiences working with Volker Bertelmann as inspirational, stating “Volker’s score is the beating heart of Hotel Mumbai, connecting the intertwining narratives of the characters we follow into one cohesive whole. It is equal parts terrifying, inspiring and compassionate. From the first frame it grabs you and never let’s go until the curtains close. It is without hyperbole that I say working with Volker was a dream come true." Volker Bertelmann is a composer, songwriter, and experimental musician who uses prepared piano as his primary instrument. The prepared piano refers to the technique of resting pieces of paper, marbles, drumsticks, and other objects on the strings to produce odd, sometimes randomly generated sounds that move the instrument in unexpected directions. His albums of prepared piano music include The Prepared Piano, a solo record of spontaneous improvisations; Ferndorf, featuring arrangements for cello, trombone, violin, and piano; Salon des Amateurs, with drummers Samuli Kosminen (múm) and Joey Burns and John Convertino (Calexico); Silfra, an improvised collaboration with classical violinist Hilary Hahn and Abandoned City. In 2015, the MDR Symphonic Orchestra commissioned two compositions for orchestra called "Cascades” and "Drowning” that were performed in the Gewandhaus in Leipzig. Volker has also built a prolific career in writing scores for films in recent years. Among his earlier film scores are Praia du Futuro, a Brazilian love story centered on two gay men which became controversial in its home country; Farewell, Herr Schwarz which touches upon German/Jewish history and Holocaust themes in a mystical way; and Craig Macneill’s The Boy, about a child who grows up to become a mass murderer. Volker’s big breakthrough in the field came through with his collaboration with Dustin O’Halloran in scoring Lion (2016), directed by Garth Davis and starring Dev Patel, Nicole Kidman, and Rooney Mara. Lion tells the true story of a homeless Indian boy from Calcutta who returns to India 25 years later in search for his birth parents after being adopted by an Australian couple. Their score went on to be nominated for numerous major awards, including an Academy Award, Golden Globe, and BAFTA. Other recent scores include Simon Curtis’ The Art of Racing in The Rain (2019), Baltasar Kormákur’s Adrift (2018) starring Shailene Woodley, mini-series Patrick Melrose starring Benedict Cumberbatch, James Franco’s In Dubious Battle (2016), and documentary Exodus (2016) by Hank Levine, which explores the current refugee crisis with individual stories.